OK, Ordog (2005) was a rather controversial album, and the feedback received worldwide was not 'warm' enough. Less than (even) average production, computer-zed music and a style fitting perfectly to what many simply refer to as 'noise'. You know, the US part of the (in general) Black Metal scene held a love/hate status from the very beginning. Hence, if you have never occupied yourself with bands from this side of the Atlantic Ocean, try to take a glimpse before proceeding to BLACK FUNERAL and Waters OF Weeping. Michael Ford seems to have put a rather complicated schedule in order to come up with this album. Be it the denial of Ordog or the added maturity (sic) in the band's 15-year career. 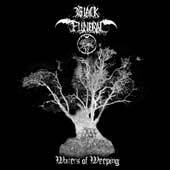 A band that was formed under the Grim Medieval Vampiric Black Metal would not release such an album in 2005 but…but..but…Waters Of Weeping seems to serve good in the scope of polluting the clean world with dozes of abyssal Black Metal the US way. Meaning: three different ways of singing will you find in this one. Howls, effect-ed screams and spoken words. Ford succeeds in matching all three under the same noisy 'umbrella', while the (so called) 'ambient' parts do fit really aptly to the means of the music's mistrust. Mistrust be it, since programmed drumming is (in my opinion) a decadent way of expressing emotions, genre-free. Still, good news comes off the guitars work. Various riffs, extended multiplicity in tempos and consistency, plus some interesting work has been offered in its production. 've not heard Sheikh Abd'ajjal's works with VROLOK but this is a strong ace for Waters Of Weeping, whose music style surely stands stronger than in Ordog.